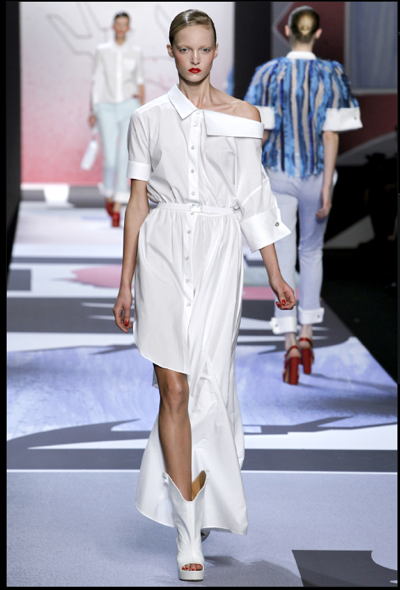 For spring, Viktor Horsting and Rolf Snoeren paid homage to that staple of the classic wardrobe, the white button-down shirt. Their long shirtdresses, shirts with tails or more luxurious silk offerings had the unmistakable charm of the Dutch duo and was one of their most wearable collections in recent years. Their experiments with volume and asymmetry were my favorite, especially when worn with relaxed little trousers and big leather clutches. The pants with the french cuffs-cuffs are an easy way to bring a little fun into your everyday wardrobe. The closing look was the most striking in its simplicity. 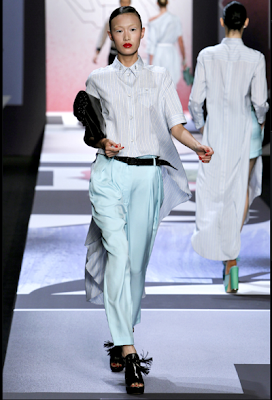 An elbow-length silk shirt with a long train worn with cropped black trousers. The mesh veil only adds to the allure and sophistication of this look (and really, the entire collection). I don't really have so much to say about this collection really. I mean, it's based on something so pure and classic, what's the point of trying to deconstruct such a simple pleasure? and major congratulations on City Style! 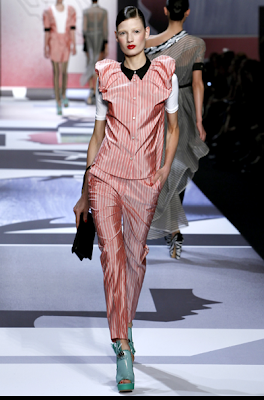 Love Viktor & Rolf. They are surrealist fashion pioneers!! Did you see the picture of Liz Goldwyn trying on the final headpiece? It's as if the piece was made specifically for the structure of her face! Love it!